For years, GMA-7 has gone head-to-head with ABS-CBN and TV5 in public affairs programming. This week comes another. The competition is on with the transfer of four of Kapuso Network's late-night public affairs programs in the 4PM block — putting them in direct competition with ABS-CBN's current affairs programs such as Bistado, Mutya Ng Masa and three more others. 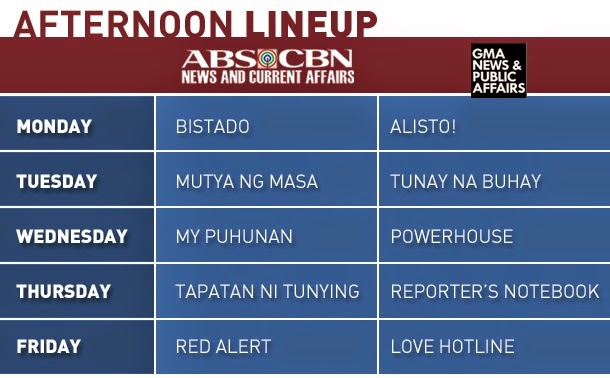 GMA News TV's Love Hotline, which is produced by GMA-7's entertainment TV, is also added to the mix, occupying the Friday afternoon slot and will be up against Atom Araullo's Red Alert. With a very tight race in the ratings, which shows do you think will come out on top? Let us know by voting in our MNP Poll below. Leave us your comments too below or on our Facebook page. You can also tweet us @medianewserphil. Bistado VS. Alisto: Which will you watch? Mutya Ng Masa VS. Tunay Na Buhay: Which will you watch? My Puhunan VS. Powerhouse: Which will you watch? 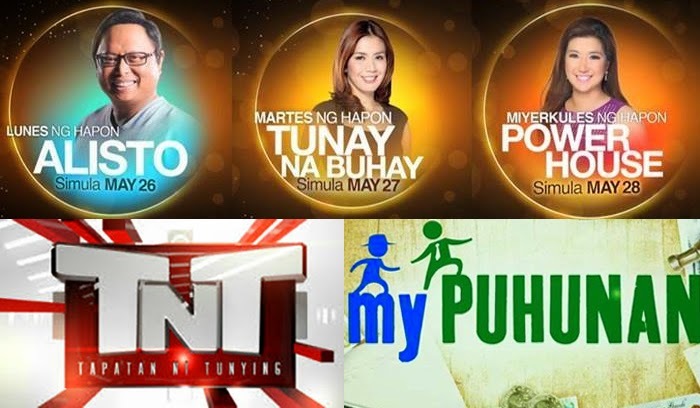 TNT VS. RN: Which will you watch? Red Alert VS. Love Hotline: Which will you watch?